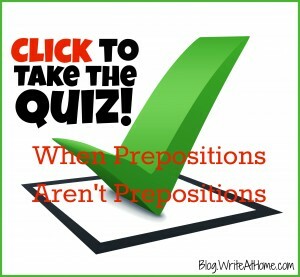 I have written previously about how memorizing the list of prepositions can confuse students because it’s common for those words to be used in non-prepositional ways. In an article called When a Preposition is an Adverb, I showed how words from the preposition list can actually be adverbs. I even included a quiz for you to test your skills at deducing how these words are used in a given sentence. But “prepositions” like in, on, over, up, down, etc. can appear as other parts of speech too. They can be used as parts of phrasal verbs—shut up, get down, come over, etc. In this case, they are referred to as particles, which is a name for words that don’t fit tidily into any of the normal eight parts of speech. These words also appear in common compound nouns like touchdown, hang up, shut in, or do over. The itsy-bitsy spider crawled up the water spout. “Up your nose with a rubber hose,” said Fonzi. Don’t be discouraged; keep your chin up. Did you see how that ball bounced up? All right, hands in the air. This is a stick up! Try to avoid causing another dust up in the conference room. Up can even be used as adjective: Are you feeling up to the task? And as a verb all by itself: I’ll take your five bucks and up you five more. Care to test your skills at determining the parts of speech of some so-called prepositions? Click the link below and take a short (10-question), free quiz. Good luck! Share your score or a comment in the Reply section below! Her room is up those stairs. Are both “up” preposition ? “Up those stairs” is a prepositional phrase, so up is definitely a preposition there. “Up north” is trickier. North can be a noun, so I guess you could consider “up north” a prepositional phrase with up as the preposition and north as the object of the preposition and the whole phrase working as an adverb indicating where. Or you could think of both up and north as adverbs modifying drove. Up is a bit redundant in this case, but it’s a common idiom. Yay! A quiz! And such an interesting topic, too! I got an 80. It might have been a 90 if I’d been more careful. . . . Ah well. Live and learn. Leave a Reply to CJ Click here to cancel reply.